Denon AVR-X2400H vs Sony STR-DN1080 vs Yamaha RX-V583 – which is better? | What Hi-Fi? Denon AVR-X2400H vs Sony STR-DN1080 vs Yamaha RX-V583 – which is better? Three feature-packed AV receivers fight for the right to control your cinema sound. Every year, the battle of the £500 AV receivers is one of the most nail-biting categories we examine. We’ve not even seen all of this year’s AV receivers yet, but already it's a fearsomely contested fight. With all three receivers on test sporting very similar features (from 4K HDR and Dolby Atmos to multi-room and hi-res streaming), it’s audio performance that will make all the difference here. There can only be one winner. Let’s find out who it is. A £500 AV receiver these days is packed with more features than a cutting-edge smart TV. From the latest video support to hi-res music and multi-room streaming, amps are more like multitasking multimedia hubs for your home. 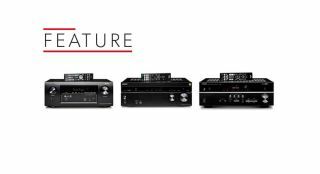 When it comes to the headline features – 4K HDR, Dolby Atmos and hi-res music support, multiple HDMI inputs, various music streaming options – these three amps from Denon, Sony and Yamaha have it covered. All three AV receivers have HDMI inputs that are HDCP 2.2 compliant, supporting full playback of 4K/60fps and HDR (High Dynamic Range) content. They – including, at long last, Sony – also support Dolby Atmos and DTS:X soundtracks - so you’re covered for multi-dimensional sound if you want to expand your home cinema. Bear in mind the Atmos configuration is restricted to a 5.1.2 speaker arrangement on these three amps, and that only a handful of 4K and Blu-ray discs support the two surround formats for now. One thing to watch out for is the number of HDMI inputs, which varies amongst the amps. Denon offers a generous eight, Sony gives you six, and Yamaha just four. You may find you won’t need more than four for all your sources, but it’s nice to have extra options. The numbers once again vary when it comes to other digital and legacy connections: Denon leads the way with a few more optical and analogue video connections, which is a pretty good deal for £500. But the other two are hardly lacking in connectivity – there are plenty of sockets on the Sony and Yamaha to plug your kit into. Music streaming is high on the priority list, with all these amps capable of playing hi-res 24-bit/192kHz music files in all popular formats, as well as double DSD. They all feature built in support for AirPlay, Bluetooth and Spotify Connect – it all works seamlessly once paired with your smart device. With DLNA on board all three receivers, it’s easy to stream music from just about any NAS device, laptop or smartphone, providing they’re all on the same network. You can connect to the internet via wi-fi or through the ethernet socket (our preferred method for its greater stability). The USB port on the front of each AV receiver will play files (including double DSD) off a hard drive or stick. It’ll charge your smartphone, too. The Yamaha RX-V583 additionally offers built-in support for Tidal, Qobuz and Deezer, while Sony adds Chromecast built-in to its list. That may suggest the Denon AVR-X2400H isn’t up to speed on its streaming smarts, but it offers Tidal and Deezer support through its multi-room specific HEOS app. Of course, each manufacturer has its own multi-room technology implemented into each AV receiver. If you do have the compatible connected products, you’ll definitely want to download the accompanying iOS/Android control app to stream music around your home. MORE: What is Google Chromecast? What products are supported? AV receivers aren’t the first in line when it comes to cosmetic upgrades, but arguably they don’t need to be. We want our AV receivers to be built like a brick outhouse, work smoothly and last for a few good years. The three AV amps here tick all those boxes. They’re sturdy black boxes, the buttons and dials all work responsively, and the displays are clear to read. There are, naturally, differences in layout (Denon and Sony offer two control dials for input changing and volume ,while Yamaha has just one for volume), but there’s nothing glaringly out of place when it comes to each amp’s design. The remotes are similar in that they’re straightforward handsets. Denon gets extra points for offering a backlit design, which makes it that bit easier to use in a darkened room. The others are still nice to hold though, and they’re intuitive enough to use when navigating through the various set-up menus. Here comes a crucial step. Before you start listening to any of these amps, you’ll want to plug in the supplied set-up mic and run the auto-calibration process to get the best sound for your room’s acoustics. Each manufacturer uses a different measuring program – Denon uses Audyssey MultEQ, Yamaha uses YPAO, Sony uses DCAC EX – but they all do the same thing: take note of your exact speaker configuration, emit either blissfully short or laboriously long test tones to measure your speakers in relation to your room, and then optimise your system’s sound accordingly. The calibration is advanced enough that you get pretty accurate results (deciding whether our speakers are large or small is the only bit that tends to tax them). We always recommend delving into the manual speaker settings to double-check and tweak the measurements, though. Sony also offers modes that correct the positioning of your speakers virtually – it’s particularly useful when your room simply won’t allow for best speaker placement. All three amps also come with a variety of sound modes too, from useful (Pure Direct cuts out all digital interferences for a cleaner signal path - it’s best used with analogue sources) to fun ones (who doesn’t want to emulate the atmosphere of a Munich concert hall or LA’s Roxy Theatre every now and then?). Yamaha’s sound modes (including the ‘sci-fi’ and ‘drama’ effects) are particularly fun to play around with. It only takes a couple of minutes of listening to the Fantastic Beasts and Where To Find Them 4K Blu-ray on each amp before we’re grinning. The Sony STR-DN1080 stands out immediately – it sounds fantastic. The subtlety and control we loved in the Award-winning STR-DN1050 of a few years ago is back, but there’s more to it. The 1080 reaches deep into its reserves to deliver sound packed with punch, dynamism and authority in a way we haven’t heard at this sort of price before. There’s an incredible amount of detail, from natural, expressive voices to layers of insight and depth surrounding each sound effect. As a glass window shatters under a spell, you can hear a sharp tinkling as well as a deep, resonant note rippling around the effect – it’s spellbinding to listen to. With the Denon AVR-X2400H, our first impression is the amp’s articulate, measured character is very similar to that of its predecessor. And considering that predecessor's our current Award-winner, that’s no bad thing. Ample detail is delivered with delicacy. Voices have natural warmth, and there’s a spring in this amp’s step that means surround effects are steered with agility and precision around the room. The Denon sticks, not unreasonably, to a refined presentation. There’s still decent wallop as magic spells blast chunks off buildings, but there haven’t been any giant leaps forward from its previous incarnation. It does sound more solid than the older X2300W, though, with thunder and explosions making more of an impact. But it's less solid than the Sony. The 2400's crisper than the 2300 it replaces, too. You can hear slightly more detail in the swish of a cloak or in sharp, shattering glass. Dialogue, in particular, is clearer and packs more feeling. But we’d have liked a bigger step on in performance when it comes to all-out scale and muscle from the Denon. If it’s scale and muscle you want, Yamaha is only too keen to make its case with the RX-V583. The deep bass in the pounding club scenes in the John Wick 4K Blu-ray hit you immediately. Each thump is well placed and loaded with a fair amount of detail too, giving you a sense of the layers in each juddering electronic beat. You’re getting more than just a wall of low frequencies – the RX-V583 reveals the gritty textures and earthy booms without getting carried away or becoming overpowering. Elsewhere, cars skid around from right to left convincingly and each gunshot is well positioned. Because we're picky, we’d like a little bit more precision from the Yamaha – playing the same scene through the Sony STR-DN1080 gives an even greater sense of the location of each sound. The Sony's gunshots are terrifically precise, and punches hit with satisfying impact. The agile and sure-footed manner in which the 1080 conducts itself around the film’s equally agile choreography is admirable. And there’s so much low-end depth and texture. It’s not quite as brawny as the Yamaha, but the Sony pulls each bass note taut, and has so much subtlety – it’s a more engrossing, satisfying performance. Unfortunately, the Yamaha receiver doesn’t have the degree of sophistication in its midrange necessary to compete with either the Denon or the Sony. Even the atmospheric whine from the soundtrack carries a little less tension when compared to the Denon AVR-X2400H's delivery, which handles scenes with a little more refinement and expression. While the Yamaha is powerful, weighty and energetic, it has more difficulty with the quieter moments. Dynamically, it pales in comparison to the Sony, which is as fun as it is insightful. Quiet moments via the 1080 are as captivating as huge explosions going off in every corner of the big, open soundfield – and the Sony handles the changing shifts with masterful control. It’s enthralling. There’s also a harsh edge to the RX-V583’s treble that becomes more obvious when you turn up the volume, so careful speaker partnering is needed. That’s a criticism we’ve aimed at Sony in the past, but it's been ironed out in the DN1080. High notes are reached with plenty of headroom and control. The sound is clear and crisp, but that vein of solidity running through the Sony amp keeps it from sounding bright or harsh. Some of that solidity and dynamic subtlety is missing from the Sony’s current arch-rival, the Denon AVR-X2400H. The Sony is demonstrably more detailed, offering a bigger scale of sound with more grunt, drive and low-end depth than the Denon can muster. Next to Sony’s more robust character, the new Denon can sound a little delicate. All three amps are adept at steering sound around the room, with the Sony and Denon’s precision giving them the edge over the Yamaha’s blunt muscle. Surround effects swirl around convincingly and you can track exactly where each noise – whether it’s a spell, a crash, a gunshot or a magical creature – is placed in the soundfield. They envelop you in a cocoon of sound, and that’s before you engage the Dolby Atmos or DTS:X 3D soundtracks. A home cinema amp isn’t a match for a dedicated stereo amplifier such as the Rega Brio, but by AV amp standards the Denon and Sony amps have an articulate, agile and rhythmic quality that does justice to stereo music. The Denon sounds dynamic and enjoyable enough when listening to a concert Blu-ray or Bluetooth-streamed songs, while Sony handles dynamic shifts and vocals in a fluid, articulate manner that sounds more musical than most AV amps. The Yamaha receiver doesn’t fare too badly – play Stevie Wonder’s Superstition and the amp kicks into gear, with the slick guitar riffs and confident drums rolling along with enjoyable momentum and tight timing. Ultimately, though, this is Sony’s show. The STR-DN1080 delivers a compelling, confident performance that brings a flavour of cinematic magic into your home. We’re no strangers to how accomplished a £500 AV receiver can be (or £550, in Sony’s case), but it’s such a step up in performance – especially compared with the better-than-before Denon – we can’t help but be impressed. We did wonder, when we first tested the Denon AVR-X2400H, if the incremental changes to the amp’s sound would leave it vulnerable to attack from its Sony and Yamaha rivals – and we were half-right. Denon’s conservative approach may be bested by Sony’s punchier and more dynamic performance, but it still holds its own. The Yamaha RX-V583 is the relative disappointment. Despite being powerful and energetic, and delivering its usual brawny, large-scale sound, it lacks the poise and precision to balance out all that muscle. Denon’s articulate and agile character offers more satisfaction, where the Yamaha goes about things a bit bluntly. Sony still has to face rivals from Pioneer and Onkyo before the year is out, but it can go into that fight with a bit of swagger. The excellent STR-DN1080 emerges as the winner in this test. If you’re after an affordable AV receiver that’s decked out with the latest format technology, streaming smarts and superb surround sound, this is the amp to buy. VERDICT: It’s not perfect, but Yamaha’s AV receiver still packs a punch.